The Time Mastery Profile includes a workbook with practical tips to help employees improve their time-management skills in 12 key categories. The workbook supplies a detailed framework for a personal action plan under each of the 12 headings. 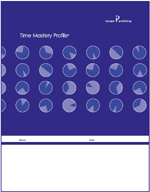 Written in contemporary language for all levels of the organization, the Time Mastery Profile is comprehensive and fast. Most people need less than one hour to take the first steps toward more effective management of their time. The DiSC® Preview was designed to raise interest or increase the comfort and confidence in decision makers in using DiSC. Manufacturer: John Wiley & Sons, Inc.